Frequently asked questions about the float and its relationship to the I.O.O.F. Q: What are the benefits of the float to the Order? A: The float delivers an annual, highly cost-effective, positive public relations and promotional message to an audience of about 700,000 local and at least 70 million worldwide via television. Some estimates of the international audience exceed 300 million. Decorating the float brings together members of ALL branches of the Order from ALL across the country to work on a common project. This is partcularly beneficial to our youth from the Theta Rho and Junior Odd Fellows who provide much of the manpower. Decorating the float is one of very few activities in which our youth work side-by-side for 5 days with the members and officers of the Encampnent, LEA, PM, LAPM, the GL, and the SGL. A: No, we are NOT alone! However we are one of the first, dating back to 1908 and every year since 1955. The Lions Clubs International and their youth Leo clubs also use the parade to cost-effectively promote their service message. Lions Float, Inc., their non-profit corporation was formed in 1994 to direct the preparation and funding of their float. Each year LCI's President and 1st Lady ride their float in the parade and up to 4 other seats are offered to their members and clubs via a "Ride of Your Life" package for $5,000. While many fraternal and service organizations report declining membership, Lions Clubs International is experiencing its fifth straight year of membership increase. The Kiwanis entered their first float in 1965 and have entered a float in the parade every year since 1986. The Kiwanis have established an endowment fund to eventually permanently fund their float. The Rotarians started in 1927 and have entered a float in the parade every year since 1980. This link explains why the Rotarians enter a float in the parade. The Shriners Hospitals for Children has entered floats in the 2012, 2013, 2014 and 2015 parades. Q: Are any grand bodies, such as the SGL, in any way financially responsible for, or at risk from the float? A: The SGL has never been responsible for the float. By incorporating the Odd Fellows and Rebekahs Rose Float Organization as a stand-alone non-profit, we have absolved the SGL, all jurisdictional Grand Lodges, and all individual lodges of any and all potential risk or financial responsibility for the float, both currently and into the future. Q: Does the SGL of the IOOF own the name Odd Fellows? Q: How is the float funded? A: The float now survives entirely on voluntary donations from members of the Order, from individual lodges around the world, from some grand lodges, from the public, maybe corporate sponsors some day, and any funds we can generate from the sales of float related memorabilia such as shirts and pins. By incorporating as an independent non-profit charity we have protected the entire Order and we can accept tax deductible donations from many sources to help pay for the float. Our financial responsibilities are presently just for the 2015 float and the operation of the corporation. Q: Why should there be an Odd Fellows & Rebekahs float in the parade? A: Very simple, the benefits to the Order are great, and now that the float is independently incorporated, there are no risks to the Order. Q: Is the float a cost-effective public relations and promotional vehicle? The parade is televised on ABC, NBC, Univision (in Spanish), HGTV, The Travel Channel, RFD TV, and KTLA. 2011 - The parade had a total television reach of approximately 47 million television viewers in the U.S. and was seen by approximately 28 million viewers internationally. 2012 - 700,000 local attendance (with at least 70 million watching via worldwide television, and some estimates of the international audience exceed 300 million). Cost of our 2012 float: $70 thousand delivered 73 seconds of worldwide TV coverage during the parade, plus whatever additional publicity results from TV, radio, and print media articles and interviews, and people who view and visit the float in person during decorating, and before, during, and after the actual parade. 2012 - In comparison, NBC reports that Super Bowl XLVI was seen by 111 million viewers. NBC sold all the commercial airtime for the game and even had a waiting list of advertisers. The average cost for a 30-second spot was $3.5 million, with some time slots costing as much as $4 million. 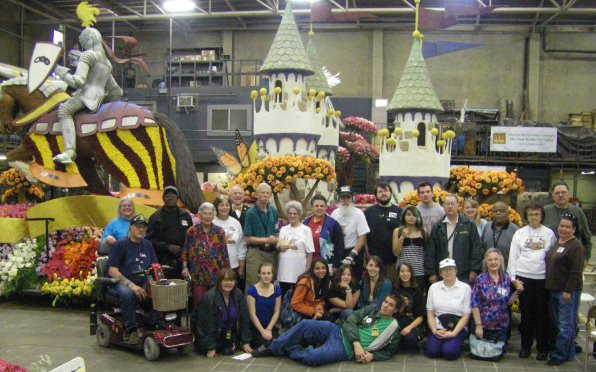 Rose parade: We reach at least 70 million TV viewers on multiple networks and stations (e.g. ABC, NBC, HGTV, KTLA) for about 1 minute on each network for about $75 thousand. Super bowl: Advertisers reach about 110 million TV viewers for 30 seconds at a cost of about $4 million. P.T. 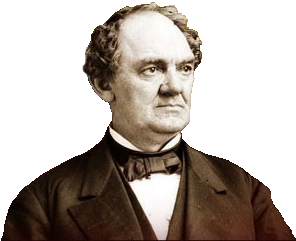 Barnum (1810-1891) was an Odd Fellow. He is considered by many as the world's most famous marketing genius. A friend asked him one day - "What inducement had you for becoming an Odd Fellow! Certainly you never expect to need their assistance?" "No," was the reply. "but they need mine, and I want no greater pleasure than that which a man feels when he is bestowing his charity where he knows it is needed and deserved; and in these days of humbug it is quite a blessing to be able to expend money for charity, and to know that the recipients of your bounty are not a set of swindlers, who live by begging in the name of some charitable institution with a fine title." Mr. Barnum can still be of assistance to the Order. Advertise your business. Do not hide your light under a bushel. Whatever your occupation or calling may be, if it needs support from the public, advertise it thoroughly and efficiently, in some shape or other, that will arrest public attention. I freely confess that what success I have had in my life may fairly be attributed more to the public press than to nearly all other causes combined. There may possibly be occupations that do not require advertising, but I cannot well conceive what they are. Men in business will sometimes tell you that they have tried advertising, and that it did not pay. This is only when advertising is done sparingly and grudgingly. Homeopathic doses of advertising will not pay perhaps - it is like half a potion of physic, making the patient sick, but effecting nothing. Administer liberally, and the cure will be sure and permanent. Some say, "they cannot afford to advertise;" they mistake - they cannot afford not to advertise. In this country, where everybody reads the newspapers, the man must have a thick skull who does not see that these are the cheapest and best medium through which he can speak to the public, where he is to find his customers. Put on the appearance of business, and generally the reality will follow. The farmer plants his seed, and while he is sleeping, his corn and potatoes are growing. So with advertising. While you are sleeping, or eating, or conversing with one set of customers, your advertisement is being read by hundreds and thousands of persons who never saw you, nor heard of your business, and never would, had it not been for your advertisement appearing in the newspapers. Television is the modern equivalent of newspapers in Barnum's day. We, as an Order, cannot afford NOT to advertise. If we fail to regularly remind the world of our existence and what we represent, then, surely, we will be relegated to insignificance, if not the dustbin of history.